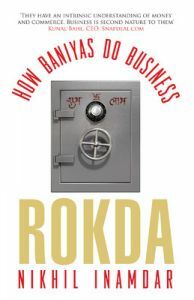 Baniya - a derivative of the Sanskrit word Vanij, is a term synonymous with India's trader class. Over the decades, these capitalists spread their footprint across vast sectors of the economy from steel and mining to telecom and retail. And now even e-tail. Nikhil Inamdar's Rokda features the stories of a few pioneering men from this mercantile community - Radheshyam Agarwal and Radheshyam Goenka, founders of the cosmetic major Emami, Rohit Bansal, co-founder of Snapdeal, Neeraj Gupta, founder of Meru Cabs and V.K. Bansal, a humble mathematics tutor whose genius spawned a massive coaching industry in Kota - amongst others. Through the triumphs and tribulations of these men in the epoch marking India's entire post independence struggle with entrepreneurship from the License Raj to the opening up of the floodgates in 1991 and the dawn of the digital era - Rokda seeks to uncover the indomitable spirit of the Baniya. Nikhil Inamdar is a Mumbai based financial journalist. He was a prime time news presenter with NDTV Profit and worked for several years as a television correspondent at other reputed news channels after completing a postgraduate degree in broadcast journalism from the UK. He is currently consultant columnist at Business Standard Online. This is his first book. by Subroto Bagchi is chairman and co-founder of MindTree, one of Indias most admired software companies. He is Indias bestselling author of business books, with titles like The High Performance Entrepreneur, Go Kiss the World and The Professional to his credit. His business book for young adults, MBA a... View More Subroto Bagchi is chairman and co-founder of MindTree, one of Indias most admired software companies. He is Indias bestselling author of business books, with titles like The High Performance Entrepreneur, Go Kiss the World and The Professional to his credit. His business book for young adults, MBA at 16, was published in 2012. Subroto Bagchis books have been translated into Hindi, Marathi, Malayalam, Tamil, Kannada, Korean and Chinese. Subroto lives in Bangalore with his writer wife Susmita. They have two daughters, Neha and Niti.